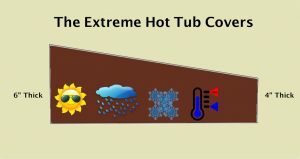 The Cover Guy is one of the original online Hot Tub Covers eStore in the UK! 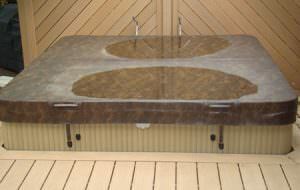 We’ve been providing custom quality Hot Tub Covers at a great price and with great service since 2005. We take pride in providing our customers covers that last long, and perform better than any other covers available. The quality of our materials and workmanship are second to none and each cover is designed to withstand even the harshest weather. 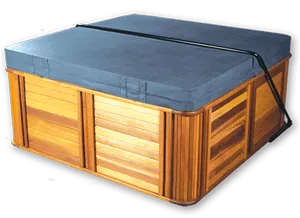 We provide customized covers for all hot tub models, including, SpaForm, Arctic, Canadian Spa Company, Jacuzzi hot tub covers, Coleman spa covers, Sundance hot tub covers, Hot Spring spa covers, Marquis spa covers, Cal spa covers, and Dimension One spa covers. We also take special requests for extra long, wide or three-fold covers. 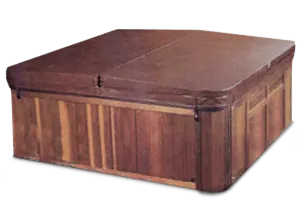 The Deluxe Covers are 5 inches thick in the middle that slopes to a 3 inch thickness on the outside edge of the hot tub cover. Our Deluxe cover is our number one selling cover. The Deluxe covers are suited for just about any climate and condition. We often refer to the deluxe as our all season radial tire of our lineup. The Cover Guy Deluxe hot tub cover is light weight but has an incredible heat retention that cuts down on your heating costs. 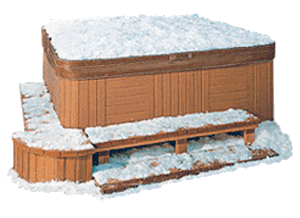 Our Deluxe Cover is perfect in most conditions snow, sun, rain, or ice. All of our Deluxe covers also come with the four locking straps to keep everyone safe. The Extreme Covers are 6 inches thick in the middle and slope to 4 inch thickness on the outside edge of the cover. Our Extreme spa cover is best suited for the coldest areas of the country that also have snow fall. The Extreme cover will retain the most heat out of all our covers and carry the most weight. The Extreme is built for extreme weather conditions, but will also help if you have large pets and animals that like to sit on your hot tub lid. Like all of our covers the extreme also keeps everyone safe with our four locking straps. The Standard covers are a 4 inches thick in the middle that slopes to 2 inch thickness on the outside edge of the spa cover. Our Standard cover is a perfect cover for any hot tub or spa in a warm weather climate. 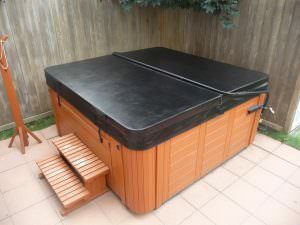 The Standard cover is also great for indoor heated hot tub areas in homes or resorts. 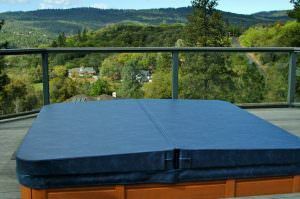 The Cover Guy Standard Tub Covers are light weight and will retain heat, moisture, and chemical odor. 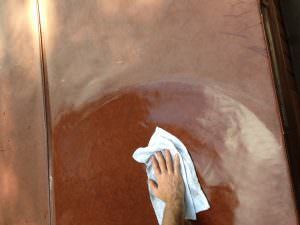 The Cover will also keep unwanted debris out and help protect the hot tub surface from any damage. Most importantly the Standard Cover also comes with four locking straps that will keep children and pets safe. One of the first questions you will have is how do I know I need a new cover? There are a couple of tell tale signs that you are in need a of a new hot tub cover. The first sign is that the cover has become very heavy and is hard for one person to remove. As soon as you need a partner to help lift off your cover its probably time for a new one. What has happened is that the cover has become water logged, saturated with water and there is simply no cure or repair for this. The next sign is a little more obvious torn, ripped, non-fitting covers need to be replaced. Great cover and colour, fits perfectly (made to measure) and better quality than my original cover. I can’t believe how heavy and water logged to old cover had become, I should have replaced the old cover earlier. We are very pleased with our new cover. We have an old Hydropool which is now on cover number three including the one which came with the tub. Everything is as described, the fit is just right and communication and delivery were very efficient. Hot tub cover fitted perfect, very pleased. Fits my tub perfectly and 7-yr warranty is remarkable. Very helpful and efficient service, the cover was an excellent fit, better than the original.